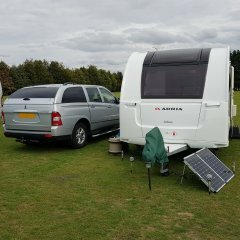 I am considering fitting Tyrepal just for the caravan but wondering about the range, they quote7m which in my setup will be right on the limit. I know you can get a repeater but didn't really want that complication. Has anyone found any issues with the distance between the sensors and the display on larger units? It's a good idea because I find the same problem putting pegs under the van, but I would have thought the "Rock" would spin round the peg when tension is applied to the shackle. Or does the fact that the peg is at an angle to the "Rock" and friction of "Rock" to the ground stop that? With Calorlite slowly disappearing I was looking at other light weight alternatives. I don't have any local gas retailers who will fill Safefill and I would prefer not to have a fixed refillable installation. That leaves Gas Light I think. Is anyone using 10kg Gas Light in a 2014 Challenger? If so what mods were necessary. Can you get it in the locker and then is there enough clearance to get an adaptor between the top of the cylinder and the roof of the locker. If anyone has dimensions of the cylinder with adaptor fitted that would be a great help, together with the make of adaptor if possible. Apologies if this has been discussed before but searching forum didn't turn up the specific information I was looking for. Thanks. I'll speak to the storage site and see what they will do. We keep our van in a storage site that opens at 0800 and have a holiday coming up with a long journey which means we would like to get away earlier. There isn’t room at home to park the van overnight. I did think about picking up the night before and going to a local camp site but sites don’t like early departures much either. I did wonder about stopping at a service area that allows over-night stops but wonder how much sleep we would get. Is anyone else in similar situation? Hi I was thinking of getting one of these but just had some slightly different advice about cancelling from CPW. They said that although you can cancel at any time, the contract is for one month and they need 30 days notice of cancellation after that minimum contract period. This would mean you actually end up paying for 2 months. Thanks for the information. I'll make a note of when I installed it in the service book. I just bought a Gaslow EasyFit replacement hose and it is dated 03/14. Is it normal for something that is sold as new to be already a year and a half old?